OCTOBER 2018: Trent and Peak Archaeology invited DVS along to Southlea Farm on Thursday 11 October 2018 to tell us more about their recent archaeological investigations. The visit did not involve actual fieldwalking or finds-processing as the DVS has done before, but we were shown where numerous trenches had been dug along the route of the proposed new River Thames Scheme. We watched the archaeologists at work in the trenches and ditches, and learned more about the different layers in the soil and rock, and the meticulous process of recording finds. The team had been paying particular attention to four barrows (burial places) and other earthworks which had been revealed by geophysical surveys. One of their trenches ran across the width of the largest barrow which allowed us to better understand their size and scale. Afterwards we were shown some of their finds of flint and pottery. The event was arranged rather hurriedly as we had very short notice, and only a few DVS members were able to attend. If you missed it, the good news is that Trent and Peak Archaeology plans to hold an event next year in collaboration with DVS so everyone has an opportunity to see what has been going on and what has been found. (The archaeologists were also collecting 10-litre tubs of earth to be analysed in greater detail back in their laboratories, and these results will also be available then.) Details to follow as soon as a date has been confirmed. SEPTEMBER 2017: Preliminary surveys are being carried out by the Environment Agency (EA), along the proposed route of the River Thames Scheme (RTS), the new flood relief channel from Datchet to Teddington. Under current plans, the channel will run through the prehistoric settlement site at Southlea Farm, which is of great interest and concern to the DVS. From 1996, a DVS group investigated cropmarks seen in aerial photos of Southlea, with exceptional results. Finds ranged from the Neolithic, Bronze and Iron Ages to the Roman period; from 6000 years ago to 1600 years ago. No excavation was done, just searching for flint and pottery brought up to the surface by ploughing. This is called field walking, and the EA will be using it to assess whether archaeological material is still to be found, and if excavation should take place. The EA will bring in its own team of field walkers, but a few of our experienced walkers will be able to take part too. 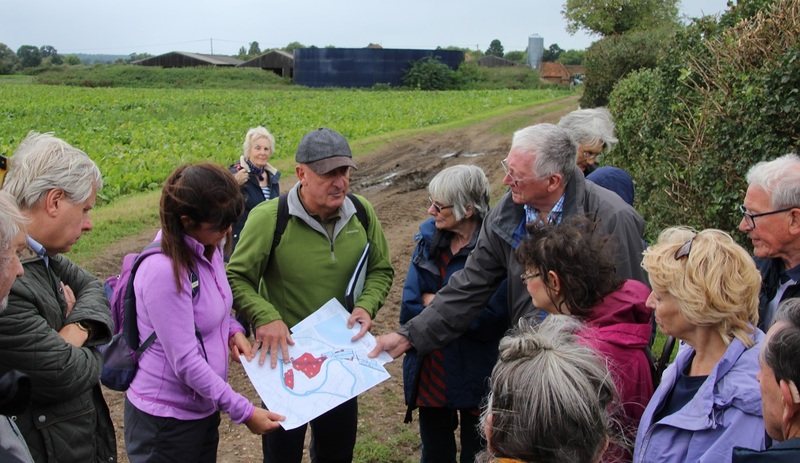 In September, DVS members were invited to visit Southlea by the kind invitation of the farmer, Nigel Berryman, and we were able to see where the RTS channel will branch off from the Thames, and roughly where the prehistoric settlement lies in its path. (Click here for photos of our visit.) The RTS will obliterate much of this landscape and the farm, and our best hope is that rescue excavation will be carried out, but that depends on what is found by field walking. The EA team and the archaeologists who will be working at Southlea are very keen to make sure that the community is kept informed of what’s happening, especially if the archaeology proves to be as interesting as is hoped. So if there is any news to report later this year there will probably be a presentation to the Society, perhaps with new finds to be shown. (Before we get too excited, it may be that ploughing has already brought up what was there and nothing is left below.) You can click here to read more about the EA archaeological surveys. Your comments are very welcome; whether as contributions or corrections to current pages, suggestions for topics, or queries about any aspect of the village society and its activities.